Ask The Bellwether: What do you teach in Spin a Fine Yarn? What do you teach in Spin a Fine Yarn? Spin a Fine Yarn is also called Lace, Anyone?. This is the first class in the Spinning III Series, it is followed by Spinning Slippery Fibers and Constructing Yarns. Next workshop: Monday, April 14, 10:30 - 12:00, at A Dropped Stitch in Sequim (call them at 360-683-1410 to register). $20 includes materials, or $45 for the whole Spinning III series; the other classes are at 2 week intervals, April 28 (Spinning Slippery Fibers) and May 12 (Constructing Yarns). 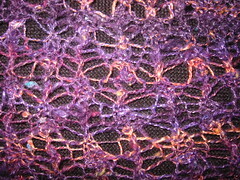 Participants can bring fibers they want advice on; materials are included in the workshop price. Participants need to be able to spin a consistent single; they need to bring a wheel and three bobbins (spindle spinners also welcome ... bring your lightest spindle and one other), notepaper, and pen. Wheel spinners ... please leave your WooLee Winder at home for this class, put your regular flyer on your wheel. If you have more than one flyer whorl, bring the others. If you have cotton cards or fine wool cards, bring them as well. ~ How do I use the Ratio on my Spinning Wheel? ~ How can I Spin Fine Yarn? How can I Spin Sock Yarn? ~ How fine do I spin my singles to get a target WPI in my plied yarn? ~ How do you ply fine singles? 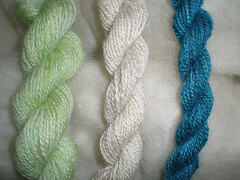 A really great article by tnwevr, on her blog Fiber Life, Spinning Frog Hair and Hamster Floss.